Region: This Caterpillar is found in the southwestern United States and the Far West. Life cycle: This insect produces two to four generations each year and overwinters as a larvae in garden debris. They pupate in leaves and flowers at the tips of twigs. Physical Description: This 1/2 inch long caterpillar is light green or gold with a light brown head. The adult moth is tan or rust colored with a black mark shaped in a V when the wings are folded at rest. The wingspan on this moth is about 1/2 an inch. The eggs are cream colored discs that are laid on both leaf tops and bottoms in overlapping masses. Feeding characteristics: This pest attacks apple, apricot, citrus, pear, and plum plants. 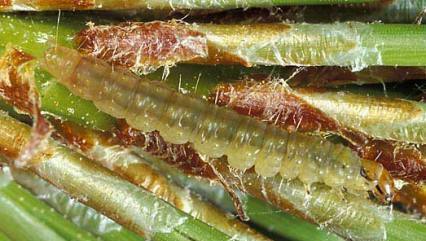 The larvae make nests by rolling leaves into a web and feed within on the foliage. They will also bore into citrus, such as oranges, scarring them near the bottom and causing them to drop before their time. Controls: Destroy the eggs as they appear and catch the adult moths with electronic light traps. If you see a caterpillar with white eggs on its back, don't pick it, as they might be the eggs of a parasite that will produce beneficial wasps. For serious infestations, Bacillus thuringiensis kills the larvae. Pyrethrum dust or spray has been found to be very effective against this pest.